Americans have elected a new president, and the implications of that election are still rippling out - as they will continue to do during this period of transition. Our country's founders set up a gap of about eleven weeks between Election Day and Inauguration back when the world was a much slower place. And probably that's still a good thing. These days, presidents have a lot to prepare for. We're continuing our series "Conversations with America" with a look at transition - a time of both uncertainty and anticipation. 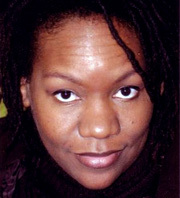 Treasure Williams is a poet and performer based in Memphis. She also teaches at Rust College, an historically black liberal arts college in Holly Springs, Miss. For her, the implications of Barack Obama's election are just starting to sink in. I'm teaching two classes this module. English 131, which is a traditional Composition 1 course. And I am teaching an English course designed around the argumentative rhetorical model. Every week we focus on something that is incredibly provocative. And I'm going to ask them if they think Barack Obama would have been elected had he been Muslim. "Okay, a five-minute quick write. Would Obama have been elected if he were Muslim? I'm gonna give you, I wanna give you a couple more minutes to respond today and then we're going to talk about your responses." I wasn't on board with Barack Obama at first. I was on board with Hillary Clinton. And I could not believe that this country would elect a black man. I just kept thinking that it was the day before November fourth, and that it would always be the day before. I just didn't think that we had actually gotten to that day. I didn't think that the first black president--I doubted that this person was born, and if they were born, I thought they were my son Ramsey's age, maybe around eight. I think that this election will define their generation. I think that they will forever be known as the Obama generation, as the kids who were never cognizant of the fact that this was long thought to be an impossibility. When I was in school, I mean, it was common for people to say, "You know, he could be the first black president. You might be the first black president." But that was sort of like saying, "You know, you might be the first black person to go to Neptune." You know, there's a lot of gallows humor in the black community, where people kind of laugh to keep from crying. There are black comedians who have these routines where, "If there was a black president, he'd be cooking barbecue on the lawn, and you know, they be listening to Funkadelic." And my children's generation will be the first ones who don't get the joke. Who actually have seen a black president, or two, in action. "All right, you can stop wherever you are. Let's, hear what you said, if you thought Barack Obama could've been elected if he were Muslim. Hasan?" "In my opinion, I think he'll still be elected, even if he is a Muslim or a non-believer." "It don't matter whatever religion you are. I can still talk to you, I can still kick it with you." "That's what it should be. If I told her right now I was an atheist, it shouldn't matter, but it does in this society." Is this the end of racism? No, unfortunately it is not. I like to give myself small heart attacks, so sometimes I listen to conservative talk radio. I don't know why I do it. I guess so I can shout in my car as I'm driving. But I've heard a couple of the conservative talk show radio hosts say, "Well, excuses are over now! No need for affirmative action now." If you have a section of the population that believes it is the rightful owner of progress, or a section of the population that believes that it will be denied progress, no matter how deserving it is, then you're losing that human capital that we have in this country. It's our greatest resource. And I think that this affirmation that I felt when I voted for Barack Obama was a similar affirmation that many caucasian Americans felt. That said, "You know, we're human. And at this point I'm going to step out of my racist historical shadow and vote my heart." I feel blessed to experience an institution like American Public Media, as well as NPR, where we can have an adult conversation and comments like those posted here. Imagine this dialogue on AOL or for that matter any conservative blogs. The responses to the question of a muslim president, were it even posed, would sound and feel much different. Having said that, yes, it IS still incredible and wonderful and beautiful that we have come together as a country to elect this amazing man. People in droves have finally refused to be Roved and pushed by the right-wing media, and have elected simply the best, the only choice for this huge job. Thank you Treasure, for reflecting on what so many of us, not just black Americans feel. Yes, Barack Obama's election feels liberating, and he inspires so many possibilities for me as well. It's strange that we consider Barack Obama a black man. His father was black; his mother, white. If his father were white and his mother black, would that make him a "white" man? He is not a black man nor is he white. But we are wrongly obsessed over skin color. The important thing is that Barack Obama was created by a great, loving, inscrutable God. It will be interesting to see what unfolds with His creation. I do not necessarily believe that a black man will ever be elected Chief of an American Corporation less the President of the United States. Factor out the religion and race, when I was at Langston University in 1981, a predominantly black college, it was actually a seated opinion among undergraduates that the White race will never allow a black man to run a first rate American Corporation, not to talk of this country. I got my Ph.D from Oklahoma State University in 1984, and got my first job as an Asst. Professor at Washington State University, Pullman. My secretary at that time refused to type my research paper, according to her: she has never worked for a black man and she does not envisaged that the college would have employed one for her to serve as a secretary to. To say the truth: America has actually come a long way. I still wake up daily from my slumber and pinch myself: Is it really true that Barak Obama, a black man with probably the clumsiest name for an American, is President elect! The whole white race deserve my apologies. You guys have really live-up to that Preacher's dream : A nation where a child should be judged by the content of his character and not the color of his skin. Thank you Treasure for that Discussion. I don believe the President-Elect Obama would have been elected if he were Muslim. Why? well believe it or not, all human beings have some racism inside them, and i believe that if he were Muslim it would have just been too much for the American people, black, white, Asian, Latino...or any other race to handle..because of their stereotypes of all Muslims being Terrorist or supporters of terrorism, we can thank the out going Administration for that. I know Treasure and attended college with her, and she tells it like it is and what it is supposed to be. Keep up the great work at RUST College Treasure. Well stated. Unlike Mrs. Williams, I believed that Mr. Obama could, indeed, be the first American president of color. During the primaries, I was not convinced for any party's hopeful candidate. What I was leary of, however, was my voting for someone simply because of his color or her gender. For this election, my senses of self were heightened. I wanted to insure that I, as well as those I could influence, voted out of conscious rather than duty. Like Treasure, I did not think that an African American man could be elected the president ever. It has always amazed and sadden me that the conversation of race has punctuated the American dialogue for so long; as if there was any other race than the human race. Interestingly the people we call black are actually brown for the better part and in so many shades and there are no white people, people that are colorless, what infantile silliness. All people are people of color. So, perhaps the election of President Elect Obama is indicative of this young country, at long last and I borrow from the late great Arther C. Clark, coming to "Childhoods End"